Armoured Drives can provide the highest quality patios in Nottingham and surrounding areas at the most competitive prices. From flagstone to concrete slaves and block paving and Indian slabstone, we can design patios in Nottingham and Derby with any material, budget, texture or layout you may require. If you are unsure on what will best suit your home, our expert team will be able to assist with every decision during the installation process. Our most affordable option is concrete paving slabs, which benefit from being versatile and hardwearing. Available in a choice of colours and designs, flagstone concrete slabs are typically used for patios, footpaths and driveways. Concrete Paving slabs are available in a wide range of colours and designs, including plain, textured, exposed aggregate and polished versions.. 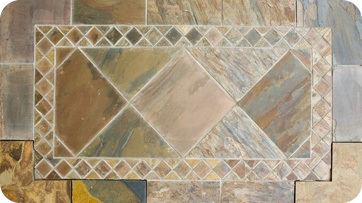 This is the ideal choice for a low cost patio. Highly versatile and reasonably priced flagstone concrete slabs are commonly used for footpaths, patios, driveways. Block paving has recently seen a reduction in price, as new production methods has led to the material becoming a more affordable choice in patios. Block paving can be used for to driveways, patios and pathways, with many commercial and public areas now being surfaced with block paving. Block paving comes with the durability of tarmac, but is more aesthetically pleasing. Armoured Drives can provide the highest quality block paving in Nottingham. Indian sandstone is growing in popularity across the UK, and Armoured Drives are installing more and more Indian sandstone across Nottingham every year. It’s growing popularity is down to it’s durability and uniqueness, with it being a natural stone that doesn’t weather. 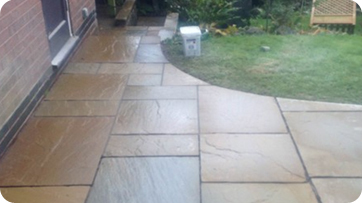 If you are looking for Indian Sandstone in Nottingham, whether it be for your patio, driveway or anywhere else, then Armoured Drives are your best choice. 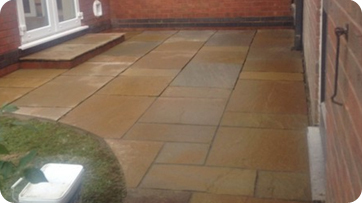 We have a wealth of knowledge in creating beautiful patios and gardens around Nottingham and we never use subcontracted labour, with all work carried out buy our fully insured experts. Call us now and receive a free, no obligation quote. Contact us at 0115 778 8190 or complete your details here and we’ll be in touch as soon as possible.